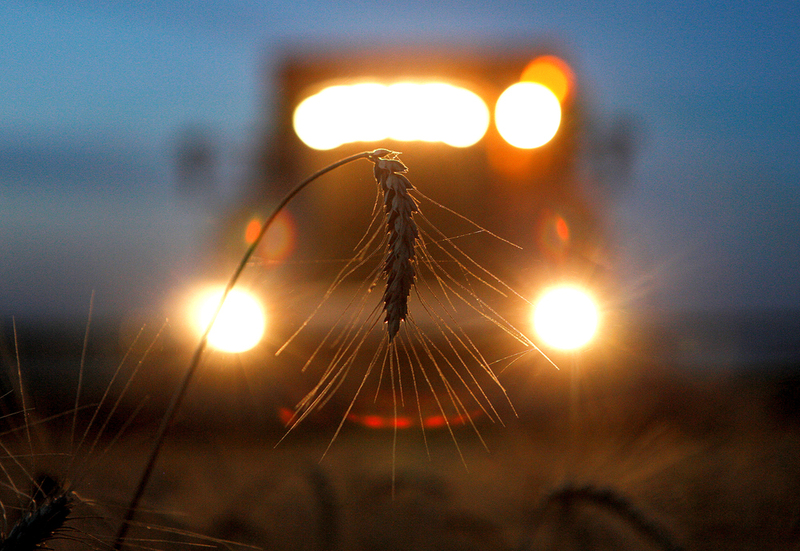 A combine harvests wheat in a field in the settlement of Novokavkazsky in the Stavropol region, Russia. As BRICS countries work to strengthen cooperation in manufacturing, infrastructure, finance and other sectors, agriculture is emerging as a key sector where the five countries could work together more closely. Agriculture emerged as a key topic of discussion among BRICS countries as food security, access to latest technologies and innovations in agriculture remain a challenge for many of BRICS grouping members. BRICS countries identified five priority areas of cooperation in agriculture sector in September and formulated the BRICS Action Plan for 2012-2016. Creating a basic agricultural information exchange system, a strategy to ensure access to food for the most vulnerable population and reducing negative impacts of climate change on food security are some of the priorities for BRICS nations in the agriculture sector. Speaking at the agri-business session at the BRICS Business Forum in New Delhi on 13th October, Anna Nesterova, founder and the Chairman of the Board of Directors of GlobalRus Trade and the acting head of the working group on Agriculture of the BRICS Business Council, pointed out that as BRICS countries have a significant impact on the global market for agricultural products, they should have a closer cooperation in this sector. However, such factors as mistrust between suppliers and traders, issues with regulatory norms, sanitary and phytosanitary requirements and controls hamper the growth of trade in this sector, she said. Nesterova has proposed creating a uniform electronic base of reliable suppliers of agricultural products, which could help businesses resolve the issues of mistrust and the safety of vendors and buyers, thereby boosting intra-BRICS trade in agriculture. “Such a platform could help identify trustworthy providers to minimize cases of fraud that are very common in this trade. This platform could have information on various vendors, their compliance with the legislation of the importing country, their supply history and so on,” Nesterova said. Speaking to RIR on the sidelines of BRICS Business Forum, she noted that there were several barriers that impact agriculture trade between countries which are currently being discussed by the relevant working groups within BRICS Business Council. “There are issues with obtaining entry permissions for each country, there are different sanitary and phytosanitary requirements for different countries, so we could create a single resource, a single window platform that could provide all the necessary documentation, assistance for the exporters and importers of agricultural goods from BRICS countries,” Nesterova said. “Such a platform could also solve the problem of distrust and protection of the buyers and suppliers. Usually, the disputes are resolved within the jurisdiction of the buyer, it is therefore necessary to create a single body to resolve such disputes within the BRICS grouping”. Another proposal Nesterova put forward at the BRICS Business Forum was to create financial instruments within the New Development Bank to lower the costs of funding for agriculture importers, manufacturers and suppliers. “As of now, the banks of BRICS countries do not have enough of credit limits and trading companies are bound to work through international, most commonly American or European banks which increases the cost of funding for agriculture importers. Creating an alternative instrument within the framework of BRICS and the New Development Bank could solve this problem,” Nesterova said. Vikramjit Singh Sawhney, Chairman of Sun Group and Chair of the BRICS Agri Sector Council, supported Russia’s proposals to create an additional instrument for cooperation in agriculture within BRICS. “Most BRICS countries depend on agriculture, and we are already cooperating within BRICS, especially in Africa, by bringing more land into irrigation and empowering the marginal farmers and also growing products like pulses. We also can share agriculture knowledge, like for example Brazil did very well in the ‘Zero Hunger’ project. Similarly, wherever India, China have done well, we need to share the knowledge,” he said. Sawhney said developing a skilled workforce in agriculture as well as addressing the issues of promoting intra-BRICS agri-trade and removing impediments and various non-tariff barriers are among the main topics discussed between BRICS nations within the Business Council framework.